Original publication date: Tuesday March 19, 2019. What sounds would you mute if you could? A pair of Boston University mechanical engineers are asking that question, with the ever-increasing din of drone propellers, airplane turbines, MRI machines, and urban noise pollution blaring in the mind’s ear. “Today’s sound barriers are literally thick heavy walls,” says Reza Ghaffarivardavagh. Although noise-mitigating barricades, called sound baffles, can help drown out the whoosh of rush hour traffic or contain the symphony of music within concert hall walls, they are a clunky approach not well suited to situations where airflow is also critical. Imagine barricading a jet engine’s exhaust vent—the plane would never leave the ground. Instead, workers on the tarmac wear earplugs to protect their hearing from the deafening roar. Leaning on their mathematical prowess and the technology of 3D printing, it turns out they can. In a January 2019 Physical Review paper, the researchers argue that it’s quite possible to silence noise using an open, ringlike structure, created to mathematically perfect specifications, for cutting out sounds while maintaining airflow. Having lived in other major cities before coming to Boston, Zhang and Ghaffarivardavagh have always marveled at the layered urban soundscape enveloping them. In Boston, the cacophony of the city is garbled together from airplanes flying overhead, the engines and horns of cars, trucks, and buses on the street, the rumble and screech of MBTA trolleys, and the hum of building appliances and power sources. City life is so noisy, you have to find a way to create quiet moments, they say. That got them dreaming up a sound baffle that wasn’t a barrier at all, but instead an open conduit. 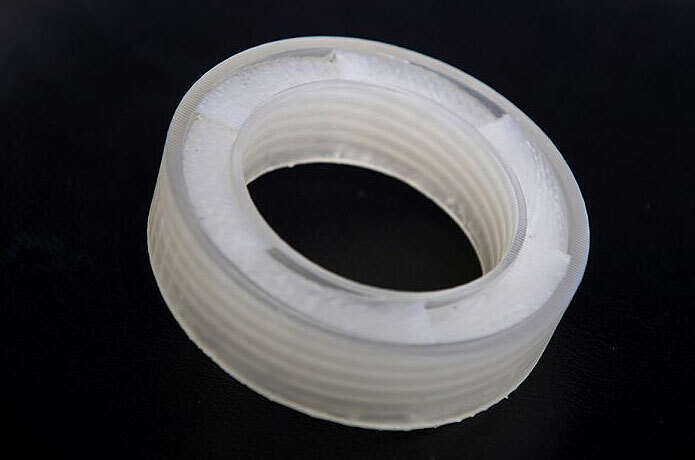 Such a feat could only be possible by developing a material with unusual and unnatural properties (known as a metamaterial), in this case with the ability to exert an isolated influence on sounds—an acoustic metamaterial. Ghaffarivardavagh and Zhang let mathematics—a shared passion that has buoyed both of their engineering careers and made them well-suited research partners—guide them toward a workable design for what the acoustic metamaterial would look like. They calculated the dimensions and specifications that the metamaterial would need to have in order to interfere with the transmitted sound waves, preventing sound—but not air—from being radiated through the open structure. The basic premise is that the metamaterial needs to be shaped in such a way that it sends incoming sounds back to where they came from, they say. By comparing sound levels with and without the metamaterial fastened in place, the team found that they could silence nearly all—94 percent to be exact—of the noise, making the sounds emanating from the loudspeaker imperceptible to the human ear. Closer to home—or the office—fans and HVAC systems could benefit from acoustic metamaterials that render them silent yet still enable hot or cold air to be circulated unencumbered throughout a building. This work was supported by a Boston University Materials Innovation Grant and Dean’s Catalyst Award.